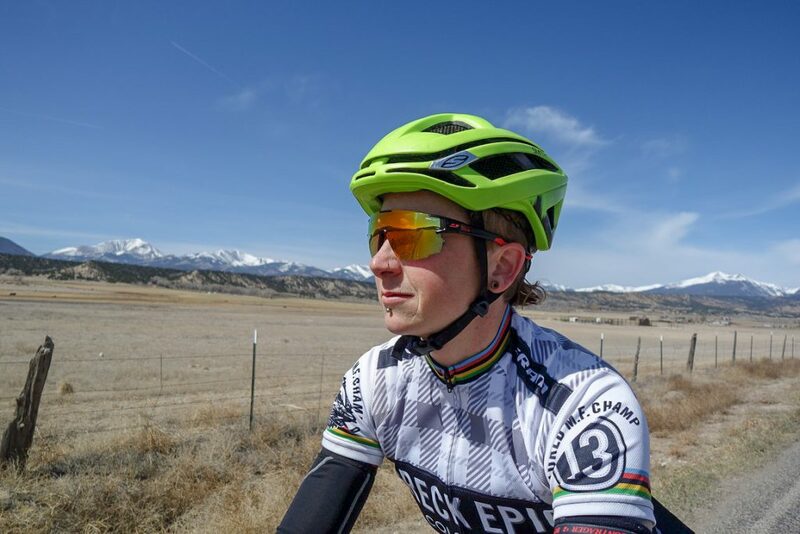 I’ve been testing the Julbo Aerospeed Sunglasses for the past six weeks in a variety of on and off-road conditions. I live in a high valley (~7,000 feet elevation) in Colorado, so the areas where I ride range from wide open plain to high desert scrub to dense pine and aspen forest. The weather can vary from stormy to full mountain sun in the space of a couple of hours. Additionally, as a valley resident, a majority of my rides begin with at least 500 feet of climbing, if not (much) more. So, I have a high demand for glasses that can tolerate a wide variety of light conditions during a single ride as well as the need for fog-resistance when climbing. These glasses tick almost all of those boxes (more on the “almost” in just a minute). When I pulled them out of the box, I was slightly worried that the plastic frame in the middle of the lens would interfere with my vision (I have a narrow face and very narrow-set eyes). This was not the case at all, so narrow-eyed people can rest assured, you’ll be fine. My boyfriend, who has a wide face/eyes tried these on and was immediately jealous that he didn’t have a pair for himself, so it’s safe to say that the fit will work for a wide variety of people. I’ve had an extremely broken nose in the past, so the fit of any eyewear’s nose bridge needs to be very gentle or else I feel like I can’t breathe out of the right side of my nose. These were grippy without being tight. I never felt like they interfered with my breathing, nor did they ever slip- even once I was sweaty and riding over rough terrain. When I first tried them on without a helmet, I thought that the downward slant of the top of the lens was odd-looking, but then, once I added a helmet and stepped outside to experience the photochromatic lenses, I realized that the downward slant was letting air circulate behind the lens- even standing still. The result? 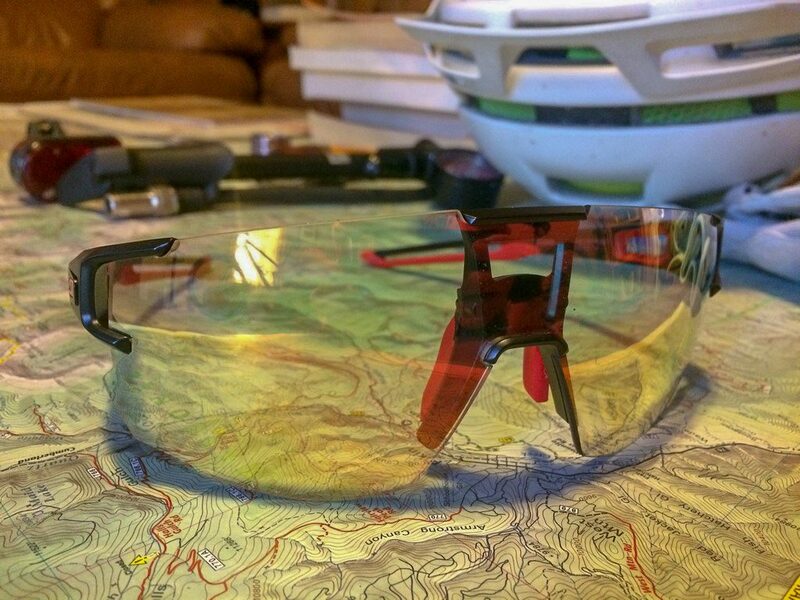 I’ve never had fogged-up lenses on a climb with these glasses. Amazing, because the bane of my previous Smith Pivlocks is taking them off, cramming them in a pocket, and dropping/scratching/breaking them because they’ve always fogged up when the climb gets hot and slow. The way the Reactiv Photocromatic lenses change tint with varying light conditions is unnoticeable- in a GOOD way! I’ve got an old pair of Rudy Project Photochromatics, and they always seemed a little too dark, and something about the color tint didn’t provide for a “sharp” image of my surroundings. The Aerospeed is light years better- it’s just always the “right” amount of tint for the light and the reddish color of them enhances contrast well. I’ve ridden in and out of dense tree and cloud cover and the amount of light they let in stays very consistent no matter what. I think once summer thunderstorm season shows up, I’m going to have to pay more attention than usual to quickly changing cloud cover since these make the light conditions seem unchanging. Unless I were riding in full darkness, these cover every type of light I ride in. The only shortcoming I’ve experienced with the Aerospeed is in low-angle light like sunrise and sunset. While they do a great job of darkening enough to mute the sun when it’s just above the horizon, something about the low angle of the light produces a glare on the inside of the lens. It’s no more than a mild annoyance on the road, but it doesn’t work if you’re riding technical singletrack where you need better visual acuity for timing over and around obstacles in the trail. Other than the low-angle light glare, these glasses perform flawlessly. They’re light, stylish, and fit well on a wide variety of faces without fogging or slipping. Instead of worrying about choosing the “right” lens color for the day (almost impossible in Colorado), they cover pretty much everything. I’ve been waiting for a pair of sunglasses that I don’t have to think about, and these fit that bill. I give them 4.75 stars, with the quarter of a star deducted because of the low-angle light glare. 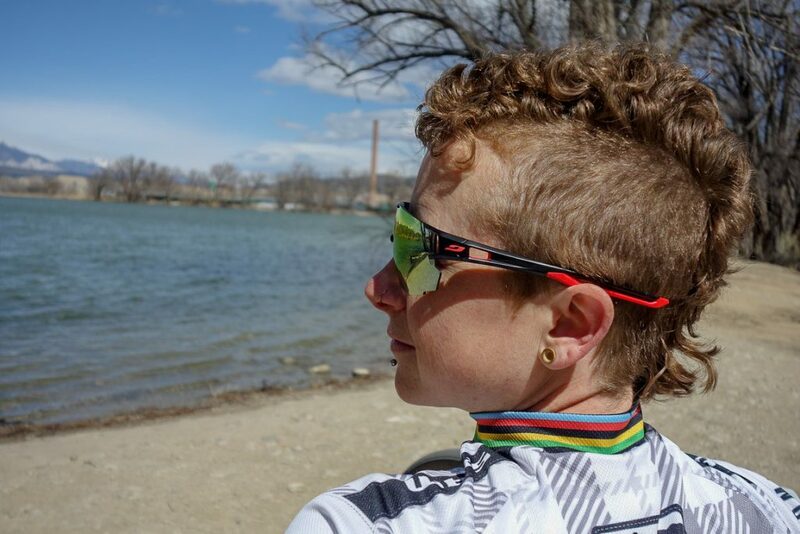 Find the Julbo Aerospeed Sunglasses on Outdoor Prolink. Not a member? Apply today! 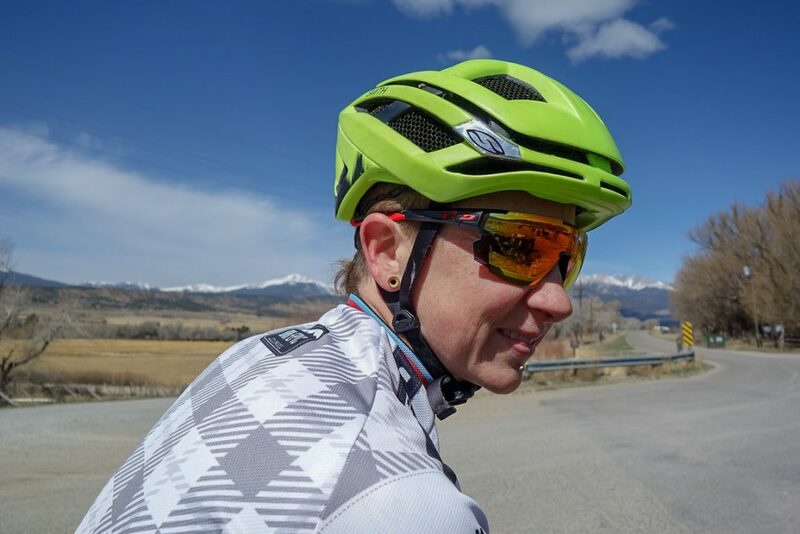 Andrea Wilson is a cyclist of 12 years, racing at the cat 1 & up level in road and mountain for the last 10 years. 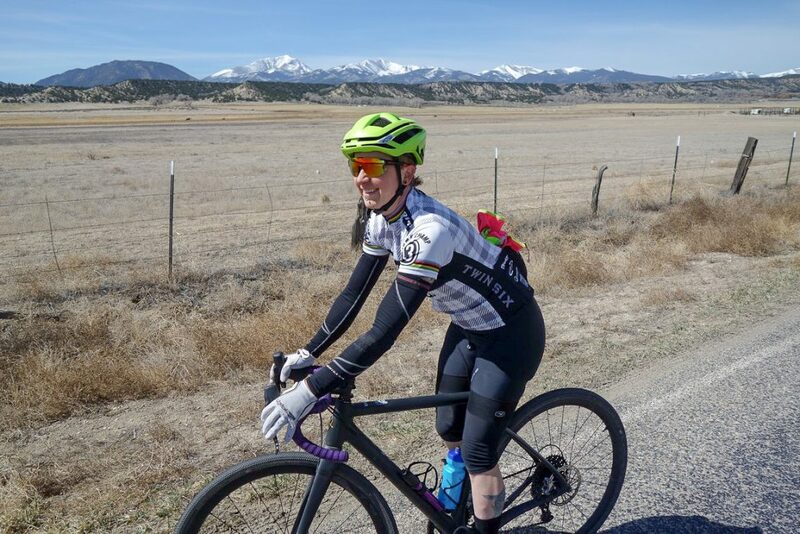 She actively seeks difficult terrain and big backcountry adventures in the nearby mountains around Salida, Colorado. When she tells people about her rides, most often say, “you rode a bike up there?! ?”.